It’s Thursday. I can’t believe it’s Thursday. I can’t believe I’m a year older. Anyways, my mind is functioning very well today (yep, I’m older), and I’ve got writer’s block. So today’s post will be a Thumbs Up or Thumbs Down post because I haven’t done one of these in ages..
To aging. And by aging I don’t mean wrinkles, retirement or senior discounts. I mean feeling added responsibilities, setting goals and realizing perhaps you’re not where you expected yourself to be, and realizing you’ve got tons to do ahead. Writer’s block. Blah. Blah. Blah. Back pain. Daddy’s not feeling well. His back hurts him. A lot. That gets two thumbs down. Blogger spell check that isn’t like Word’s who lets me add words! To aging. And by aging I don’t mean wrinkles, retirement or senior discounts (although I wouldn’t mind discounts…just sayin’) But to have had another year, and have another laid in front of you, it’s awesome. To set goals, make plans, and realize that perhaps you’re not where you expected yourself to be, your somewhere better. To NaBloPoMo, for challenging me to write every day, and to make something up because writer’s block is not an option. To my awesome family for making my birthday special, and my mother for writing a guest post. Thank you. To everyone who wrote me and wished me happy birthday, and for everyone who called. To all the wonderful people out there that read, comment, and view our blog. Thank you. Your support means so much, and every time a new follower appear, a new facebook like happens, I get all giddy and giggly and clap and do the happy dance and my heart just gets really really happy. So this Thanksgiving, I’d like to encourage you to get out there and comment on everything you read, just a little note to say hello even. A sparkle, a like, a follow, really, it’s healthy! And you will make the blogger so, so, incredibly thankful. I know I am, for all of you! And for a bit more randomness, here’s a picture from “the bottom of the old chest” as they say in Portuguese. My cousin sent this picture to me this morning, in remembrance of our childhood. Thanks Matt. 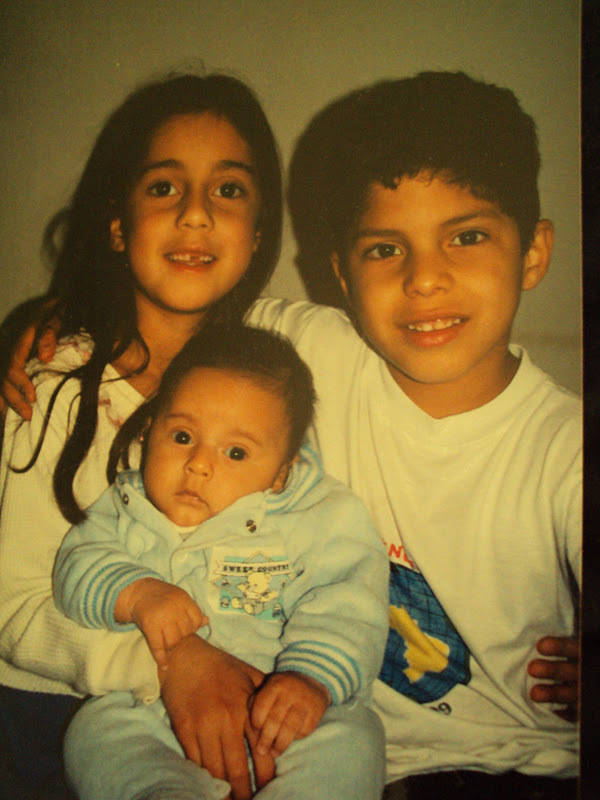 Me, Matt, and Baby Victor. Previous Article Happy Birthday Larissa.